Convenience, quality, speed – and no sticker shock! Don’t you hate it when you read about a product or tool that sounds so helpful, and then you finally see the price and nearly faint? There is no sticker shock with Invention Evaluator – it was built and is managed by experienced tech transfer and IP professionals who understand your budget constraints, as well as your need for a solution to the problems we outline below For research institutions and other non-profits, a complete 40-50 page assessment researched and crafted by our experienced professional staff costs just $699 ($995 for industry and other for-profit users). No other resource can provide you with an unbiased, objective analysis from highly trained professionals at such an affordable price – all in just 10 business days! PLUS: Each report also includes useful industry information and contacts for potential partners. An Executive Summary is provided at the beginning of each report. Problem: You have a backlog of invention disclosures and, based on current staffing, there’s little hope of getting them all processed any time soon. Not only do you risk overlooking or delaying a valuable invention, you also risk alienating faculty who expect some action. Problem: There’s internal disagreement or an unclear picture surrounding the potential value of a specific innovation – and you’ve got to decide whether to support it with budget dollars and time. 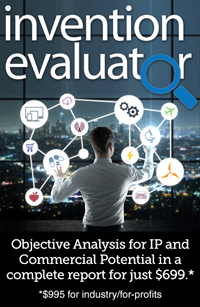 Solution: Invention Evaluator provides a completely independent, unbiased, and comprehensive look at the market, the competition, the need, and the IP landscape. Problem: One of your inventors has gone berserk over your negative assessment of his invention, and he’s gone to the administration in an attempt to force your hand. You don’t want to waste your patent budget on this “vanity” project. Solution: Invention Evaluator can provide you and your faculty with independent analysis and either support or disagree with your conclusions. Either way you win – because it’s no longer you against a valued researcher. Problem: Your office has acquired a negative view among faculty as a “black hole” where invention disclosures go to die. You want to change that perception and dramatically reduce the time it takes to assess faculty disclosures, but with staffing limits you just can’t seem to make a dent. Solution: With Invention Evaluator, you get a high-level, professional analysis of each disclosure you choose to submit returned in just 10 days. You can quickly change faculty disappointment into delighted surprise at your office’s fast turnaround and responsiveness. Problem: Although staffing levels are constant, work flow related to disclosures is not. Occasionally and without warning, your office receives an influx of disclosures that threaten to bog staff down and slow other critical work. Solution: Invention Evaluator is there when you need it, offering an easy, inexpensive way to smooth your work flow and deal with unexpected increases in disclosure submissions. You can even “bank” any number of future reports so as soon as you see staff becoming overloaded, you can send in your submission and get the extra work handled effortlessly. Seeing is believing: CLICK HERE to view a complete sample report so you know exactly what you’ll be getting just 10 days from now! After registration, you will receive an e-mail with easy instructions which will help you to submit your invention on our secure system. All information you submit is kept confidential. After you submit your invention on our secure system, it is assigned an analyst who follows a set process to review the technical merits, the intellectual property, and the commercial potential. Within 10 business days of submitting your invention, a comprehensive report will be delivered to you showing the analysis, including searches done and the results collected. The report also includes information to explain what is involved with developing your invention, protecting your intellectual property rights, and the commercial pathway(s) that may be available to you. CLICK HERE to view a complete sample report. Invention Evaluator is the brainchild of founder Michael Manion, MBA, PhD, a technology commercialization professional who’s worked both in the USA and Australia for a number of research institutes, universities, and private companies and across a range of technology landscapes. His science background is in biotechnology, with a PhD in Physiology and Biophysics, and he worked in cancer research for many years at the Fred Hutchinson Cancer Research Center. He completed an MBA in Technology Management at the University of Washington, and has successfully commercialized technologies ranging from nanotechnology, biotechnology, information technology, chemistry, physics, engineering and even toys. Invention Evaluator is a division on Tekcapital, a global university technology and intellectual property services company. We’re standing by to solve your problem right now – whether it’s a daunting backlog of disclosures, a short-term influx of work, a dispute with a researcher over commercial potential, or the need to quickly turn around one or more invention analyses. Invention Evaluator is a low-cost solution for your office – like having an extra staff member, but only when you need it and at an extremely low cost (just $699 per report for research institutions and non-profits)! And you’ll love the quality as well as the timeliness – you get your report back in 10 business days! All you have to do to get started is CLICK HERE. Once you’ve ordered, we’ll send you an e-mail with a link to the easy-to-complete submission form. Problem solved!